On December 23rd, in preparation for Christmas, 12 boys participated in a silent retreat in the parish of Our Lady of Loreto. 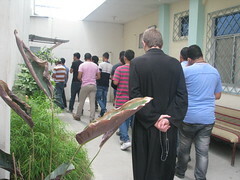 It began with Mass at 8 a.m. Following the Mass, Father Dominic exposed the Blessed Sacrament and gave some points of meditation. After an hour of adoration and benediction, we had breakfast while listening to the story of Our Lady of Guadalupe and Saint Juan Diego. 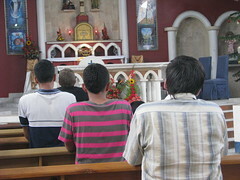 The retreat included two talks and free time in which the boys were able to listen to the voice of God in the silence of their hearts. Many did spiritual reading and meditation. 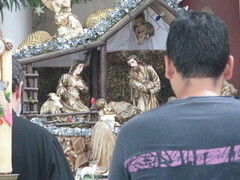 They accompanied the Blessed Virgin with a Rosary procession around the church grounds, ending in front of the Nativity Scene, situated at the side of the central altar of the Church. For most of them it was their first silent retreat. For some it was difficult, but the hardest of all was starting to talk again during lunch time. Lunch began with a big silence, but little by little they were able to share all their experiences of this first silent retreat. The youth need silence; they need space so that God can be born in their hearts.God wants to be born this Christmas into a pure and peaceful heart, not into noise and chaos.